The Zoom whitening system is very effective. The gel has been extensively tested and is much safer than products sold in supermarkets or used by beauty therapists. 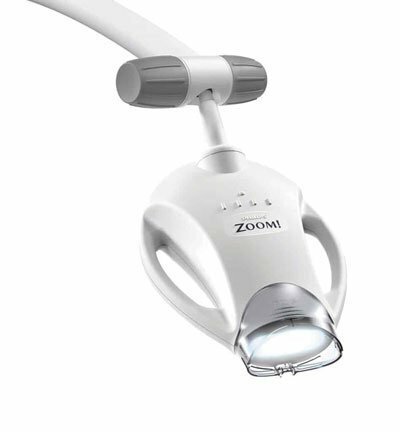 Zoom is applied in four 15-minute sessions while the patient sits in the dental chair. The process is simple and effective. The results are excellent with the teeth going seven to eight shades whiter. Patients are always happy with the results, even though some people’s teeth go whiter than others. If they start with very white teeth then they are not going to see much of a change. It’s a matter of managing patient’s expectations. The process can cause tooth sensitivity in some people but this can be easily managed. Using sensitive toothpaste and special fluoride gel will see that sensitivity disappear in a few days. I encourage patients that are interested in whitening to opt for Zoom rather than home systems. A lot of the off-the-shelf products can actually cause damage to the teeth. Having teeth professionally whitened by a dentist using the Zoom system will last longer and not cause any harm. If a patient smokes or drinks red wine or eats a lot of curries, that will have an effect on how long the teeth will stay white. Someone who looks after their teeth and has good oral hygiene habits could see the whitening last for years. Once again, it’s a matter of managing patients’ expectations. The only negative is that it cannot be used with people who have very sensitive teeth. It’s also not suitable for pregnant or breastfeeding patients.